The first wedding anniversary has several themes and symbols associated with it, although gift givers should realise there aren’t particular rules governing what should and should not be given to one’s partner or happy couple on this special occasion. Colours, themes and items can be mixed and matched to form a present that not only is sure to be appreciated by the recipients, but will also send a personal message of heartfelt love. Paper is customarily associated with the first anniversary as it has two main qualities which are considered to be relevant to this marital year. Firstly, paper signifies a blank page on which a couple can begin to write the story of their life together, and points towards a long and happy future together. Secondly, paper is easily damaged, symbolising the fragile nature of marriage, and encouraging couples to be aware of the challenging nature of the ups and downs of married life. A paper gift represents the trust, good communication and loyalty that a couple must demonstrate to each other in order to weather the storms of their relationship successfully. 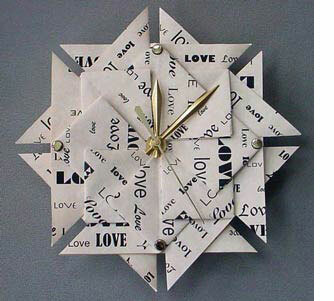 The modern gift for the first anniversary is a clock, symbolising the timeless nature of love. Flower: There are several floral themes for this anniversary year - carnations, representing passionate love; pansies, representing thoughtfulness; and orange blossom with its symbolism of fertility and purity. A gold or yellow rose in connection with the 1st anniversary colour themes would also make an excellent substitute to mark this occasion.